This vehicle was great. Perfect for our desert adventure. 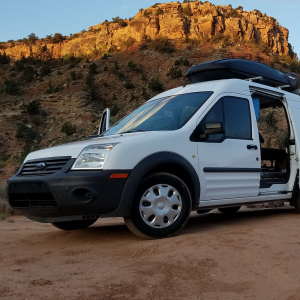 No need to bring any camping gear, this thing had everything we needed and was comfortable for two of us. Plenty of storage for our climbing gear and clothes with the topper, fridge held enough food and kept everything cool. Javier was very accommodating, picking us up from the airport, as well as picking up the van from our hotel afterwards. The van is well appointed. I would recommend this van to anyone looking for an economical and reliable ride.